The DeCoursey family was among the earliest Moundville residents, living southwest of town in Harrison Township. Little is known about this family, other than John DeCoursey was a widower by 1888 and his wife's name had been Mary. 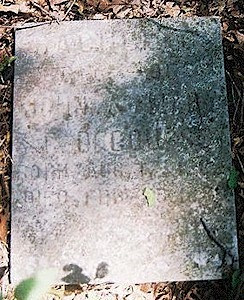 John S. DeCoursey, 1806 - 1884 was buried at Beckmon Cemetery - a deserted cemetery located 3 miles west and one mile south of Moundville. Mr. DeCoursey lived southwest of Moundville in Harrison Township. He had been born in Kentucky and was a farmer. The county death record plainly says that he was buried at Moundville. However, he is definitely at Beckmon, not Moundville Cemetery. To the right is a scan of the same stone shared by Nancy and JaWan Thompson with the engraving enhanced. 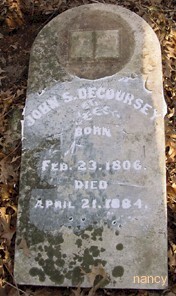 Below is information about what we assume is a granddaughter of this John S. DeCoursey. 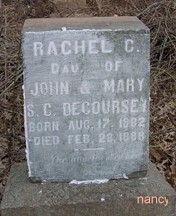 Rachel, the six-year-old daughter of John DeCoursey (son of the above John S., we assume), died in winter 1888. John DeCoursey, a widower, had gone to help his brother move, leaving his children at home. While he was gone, the dress of the youngest child came too close to the grate on the stove and caught fire. The other children tried to tear the clothing off but were not able to do it before she was burned badly. To the left is the grave marker for Rachel DeCoursey in Beckmon Cemetery as photographed in summer 2004. 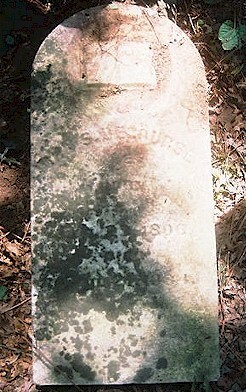 To its right is another scan of the grave marker for Rachel shared by Nancy and JaWan Thompson taken in March 2005. As you can see, they are quite good at enhancing the engraving on an old grave marker. John Mutch notes that this John DeCoursey (buried at Deepwood Cemtery in Nevada) was born 1 Sep 1849, so the 1900 Census appears to be incorrect. Otis McDowell and Miss Sarah E. Decoursey who were both from Moundville were married one Wednesday afternoon in October 1901. Sarah apparently was living elsewhere when the 1900 census was taken. Nancy Thompson found this: Nevada Daily Mail, July 3, 1917, p 8: "The body of John DeCourcy who died at Rogers, Ark., Monday, arrived here Tuesday afternoon and interment was at Deepwood. The remains were accompanied by a son of the deceased, Will DeCourcy, and a daughter, Mrs. McDowell." 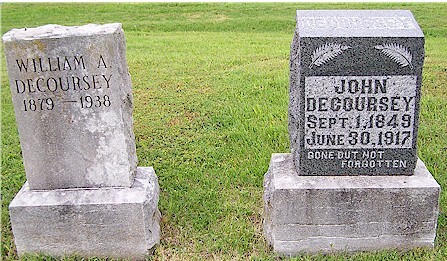 She then noted that John DeCoursey Sep 1, 1849 - Jun 30, 1917, is buried at Deepwood Cemetery in Nevada, as is William A. Decoursey (1879-1938). Photo to the right is of the DeCoursey Graves in Deepwood Cemetery. One wonders if John's wife, Mary DeCoursey, is also buried at Beckmon Cemetery since her father-in-law and daughter are there. She apparently is not buried beside her husband at Deepwood. John Mutch wrote that John Souder DeCoursey was his Great Great Grandfather. He wrote that John Souder DeCoursey was born in Campbell County, KY (there is a small village there named DeCoursey for his Grandfather). He married Sarah White in Ohio and moved to Wabash, Indiana, where they had 15 children between 1836 and 1855. Sarah died in 1864 and is buried in Wabash County, IN. Within a few years of her death, he and some of his children moved to Vernon County. His son John DeCoursey is the one who married a Mary and were the parents of Rachel, the child who died of burns. (One of John Souder DeCoursey's daughters was also named Rachel). John Souder DeCoursey's daughter Eliza Jane DeCoursey married George Cole - they lived in various locations in Vernon County and went to Guthrie, Oklahoma for a while. He died near Metz, MO and she later came to Idaho with her children, my Grandfather and his sister. One of her brothers also came to Idaho and there are still DeCourseys in this area. Contact us if you know more about this family. Go back to the Moundville page.